What does Windows 8 mean for Windows Phone? Readers of this site already know all about live tiles and Microsoft's Modern user interface (UI). Until now, knowing this has almost been secret knowledge in a world full of iPhones and Android phones. With the release of Windows 8, though, that state of affairs is due to come to an end as anyone buying a new PC will have tiles put in front of them by default. In anticipation of the official release of Windows 8, we take a look beneath the surface, and ask what does all of this mean for Windows Phone? While the reference, above, to 'secret knowledge' was tongue in cheek, Windows Phone has yet to achieve a serious amount of market share. Hence, there is still little public awareness of what live tiles are and the benefits they offer over the older types of user interface found on iOS and Android. Nokia's ad campaign for the launch of the first Lumia phones was a good first step, but it was not sustained for long enough to really make a dent in the minds of the public. That is all set to change with the release of Windows 8. Home users can upgrade by download from tomorrow. Admittedly, those who do are, probably, already Metro converts. Nevertheless, as home users replace their current computers, over the next couple of years, more and more people are going to be exposed to the "Modern UI" (i.e. Metro) and live tiles in their homes. While the tiled interface will be something that people either love or hate, Windows Phones are going to be a much less unknown proposition when people go shopping for a new phone. Will Windows Phone 8's "Modern UI" become less alien to consumers after the launch of Windows 8? Windows 8 has been built with cloud integration in mind, just like Windows Phone, and this is no coincidence. Microsoft's growing ecosystem will make its products tightly integrated with each other through SkyDrive and XBox, both of which are linked through ones' Microsoft account (formally known as a Live ID). 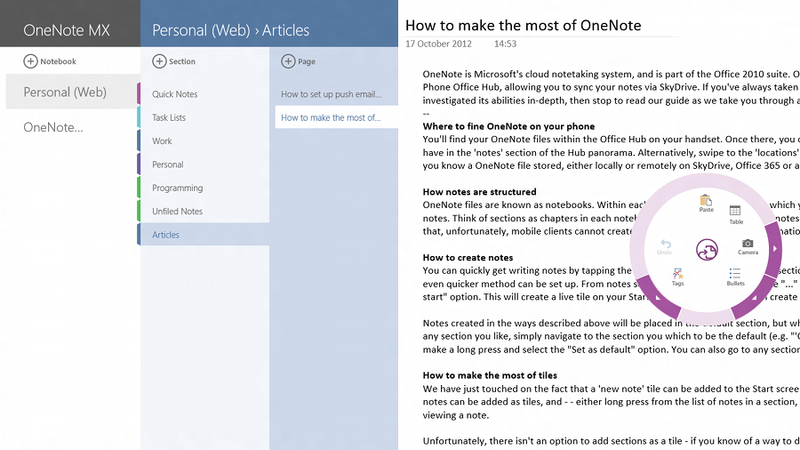 Windows Phone's implementation of Office and OneNote has always been able to read and write files directly to SkyDrive; and now, Office 2013 can do this too. This means that you can switch from editing while mobile and pick up where you left off when you get home or to the office - and Word will even remember where you were in a document. Similarly, image files can already be automatically uploaded from Windows Phone, and will are shown in the Windows 8 photos application, likewise for those manually posted from Facebook. 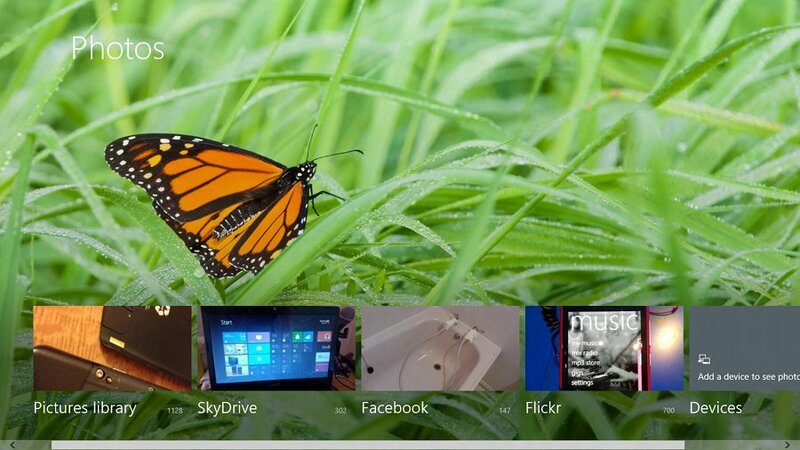 The Windows 8 Photos application synchronising content from multiple sources. On the XBox side, Microsoft is working on SmartGlass which will turn tablets and phones into companion devices for the XBox, allowing for remote control functionality and contextual information while watching movies. There will also be secondary screen and controller functionality for gaming. Furthermore, users will be able to listen to their music on any device, thanks to the XBox Music service which will offer an à la carte music store and free streaming similar to services like Pandora and Spotify. In addition to these forthcoming features, XBox Live gaming achievements are already synchronised to your account for XBox Live titles on Windows Phone. This overarching integration doesn't mean that Microsoft are forcing consumers into only using Windows Phone though. There are already SkyDrive and OneNote clients available for Symbian (upload only), Android and iOS, which are fully functional, even if the user experience isn't quite as good as on Windows Phone 7 and 8. Microsoft has already stated that XBox Music will come to Android and iOS, and there are rumours that Office for iOS and Android will appear in 2013 too. So in this respect, Microsoft is practicing good industry citizenship by not locking in its customers. For the time being though, the similarly between computer and phone will be limited to a visual sense. While applications will be easy to port between each platform, users will have to purchase apps separately for each platform. Also, at the time of writing, Zune is still the way to sync a Windows Phone, but in the near future we can expect to see a dedicated Windows 8 companion application for Windows Phone. As far as user interaction goes, this is the first time we've had smartphones and desktop computers running, what is essentially, the same family of user interface. Microsoft tried grafting a desktop UI on mobile devices with Windows Mobile, but is now trying things in reverse by putting a touch-focused user interface on PCs. This is something that even Apple, with its hugely successful iOS, hasn't managed. 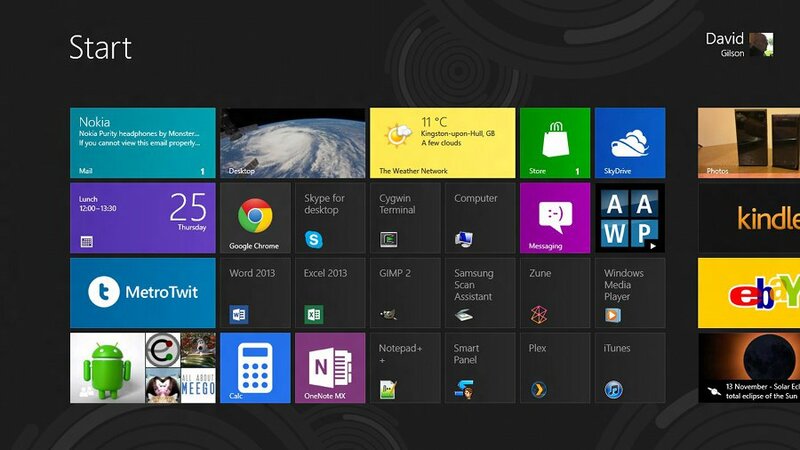 The Windows 8 Start Screen - more than a giant start menu? Then again, the lack of UI synergy in other platforms may be for good reason – there are already concerns that the Windows 8 user experience, which combines both the Modern UI and a traditional Desktop interface, will be too confusing. Having used the Windows 8 Release Preview on my main PC for several months, I have a lot of sympathy with those who say the experience of constantly switching between the two UI styles is jarring and confusing. While the experience of regularly switching between Modern UI applications and Desktop applications is definitely of concern, things may improve as more and more Windows 8 applications are added to the Windows Store. As this happens, we will all (hopefully) be able to replace more of our traditional Desktop applications with Modern UI applications. In which case, there will be less switching into Desktop mode. 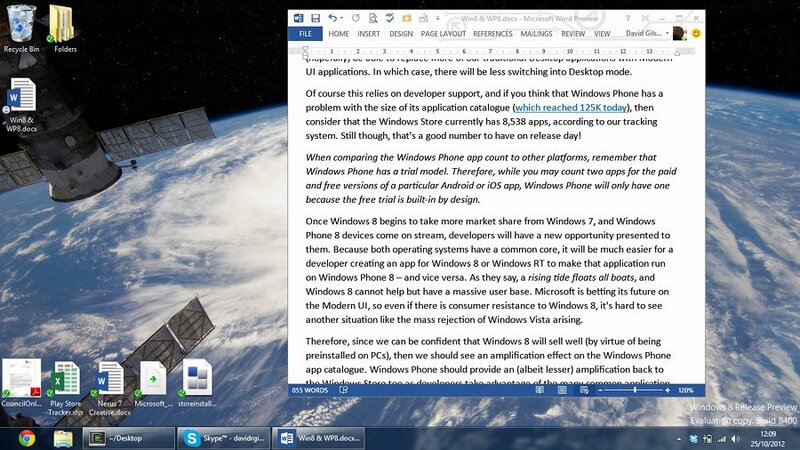 The Windows 8 'Desktop' application is still needed for some applications, but perhaps less in the future? Of course this relies on developer support, and if you think that Windows Phone has a problem with the size of its application catalogue (which reached 125K today), then consider that the Windows Store currently has 8,538 apps, according to our tracking system. Still though, that's a good number to have on release day! 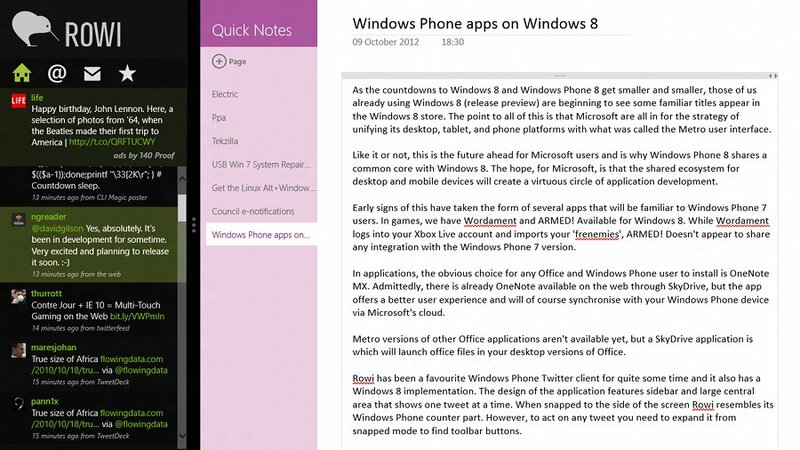 OneNote MX provides a glimpse to how fully "Modern UI" apps could look. When comparing the Windows Phone app count to other platforms, remember that Windows Phone has a trial model. Therefore, while you may count two apps for the paid and free versions of a particular Android or iOS app, Windows Phone will only have one because the free trial is built-in by design. Once Windows 8 begins to take more market share from Windows 7, and Windows Phone 8 devices come on stream, developers will have a new opportunity presented to them. Because both operating systems have a common core, it will be much easier for a developer creating an app for Windows 8 or Windows RT to make that application run on Windows Phone 8 – and vice versa. As they say, a rising tide floats all boats, and Windows 8 cannot help but have a massive user base. Microsoft is betting its future on the Modern UI, so even if there is consumer resistance to Windows 8, it's hard to see another situation like the mass rejection of Windows Vista arising. Therefore, since we can be confident that Windows 8 will sell well (by virtue of being pre-installed on PCs), then we should see an amplification effect on the Windows Phone app catalogue. Windows Phone should provide an (albeit lesser) amplification back to the Windows Store too as developers take advantage of the many common application programming interfaces (APIs) between the two platforms. Indeed, we've seen a few already. Filed: Home > Features > What does Windows 8 mean for Windows Phone?